Our Thanks to Doug Chisholm and Orin Robison for helping us fulfil a request from the Juno Beach Center to locate the family of F/O Lacey for the people of Vieux Berquin. F/O William Lacey from Driver, Saskatchewan was posted to 419 squadron in the later part of May of 1944. He came from No. 61 Base Yorkshire, which was the training base for No. Group 6 (RCAF). 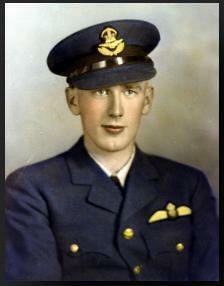 He had carried out three Operations prior to coming to Middleton St. George and being posted to 419 Moose squadron. He had with his crew flown three operations with 419 on three consecutive nights beginning on the night of June 5/6th with the target that night being being Merville On arriving over the target they were unable to fully identify their target, four minutes earlier the red and green marking flares were visible to Lacey but had disappeared under the cover of clouds when the aircraft was thought to be over the target. On that night they returned with their bomb load. On Night of June 6/7th the then P/O Lacey was to use his piloting skills to escape the attention of three separate attacks by Luftwaffe FW 290 fighters. His abilities has a pilot saved the crew and the aircraft. On the third night of June 7/8th operations against Acheres were a welcome straight forward operation with no mention of enemy actions and the crew returned to home base and given time away from operational duties. On the night of 12/13th of June P/O Lacey and his crew flew off on a mission to Cambrai. Somewhere on the journey there or on the return to home base his Lancaster was brought down near Vieux Berquin. Where P/O Lacey and four others were all buried in the local cemetery where they are still remembered by the people of Vieux Berquin to this day. The two other members of the crew Sgt. Wilson-Law (RAF) and F/O Forbes survived and became Evaders. Lake Lacey in Saskatchewan is named in F/O Lacey's honor.